By investing in a Jackson Hole AV home theatre or media room, you are investing in the good life! Your family needs to spend time together in a place that is fun to be, so why not create a place like this in your home? Relaxation, entertainment, family, friends, fun, these are all the things that we at Jackson Hole AV keep in mind when designing and building your custom made home theatre and media room systems. We offer a wide variety of options for you to choose from so that you can find the perfect fit for your family. From the screens and speakers, to the chairs and carpets. We do it all; and all with your budget and needs in mind. Jackson Hole AV has been in the home theatre business for many years and has built up a wealth of knowledge and experience; the packages we offer reflect the latest trends while still standing the test of time. We think that listening to the needs of our customers is the best way to ensure that their home theatres or media rooms turn out the way that they want, which is why we keep you involved every step of the way. 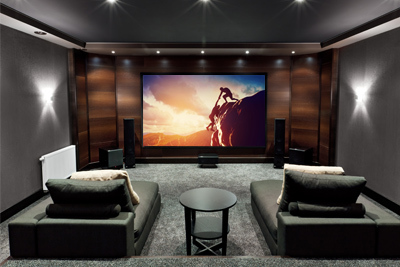 Our team of technicians design, fit and install systems seamlessly into your home so that you can start enjoying your home theater or media room as soon as possible. HDMI, 1080p, OLED, LED, LCD, 5.1 or 7.1, etc. Are these terms you should be familiar with? Not necessarily... but they are still important to the setup of today’s entertainment rooms.That’s exactly why we are here to help. With technicians educated on the very latest in audio and video technology, we are well equipped to meet your Media Room needs. Call Jackson Hole AV today to find out more about how we can make your home theater dreams high definition a reality.